The horse conch (scientific name: Pleuroploca gigantea) is the state shell of Florida. It can be very large – up to 2 feet long! My photo above shows two empty shells that we found while boating on the river. Read more about finding that 17 inch, huge horse conch shell. Please feel free to download and print out this horse conch outline to use for personal use only. Homeschoolers especially love these free printouts, and if you search this blog, you will probably find more information about these seashells and the mollusks that made them. 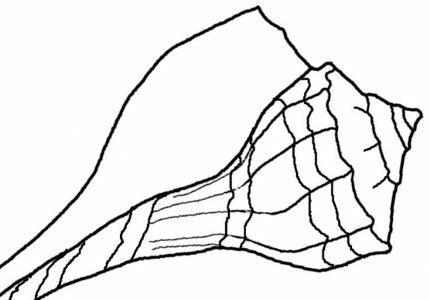 The outline below shows the Living Florida Horse Conch with (bright orange) mollusk inside and operculum that covers the mollusk. Here’s a fun fact: The horse conch eats lightning whelks! Previous Post Where Do You Stay In Florida? Thanks for connecting Anita’s Sea Shell story to yours! When Anita first told this story to the group, I heard she brought in all of her sea shells for the group to see. I am sure she would have enjoyed reading your blog!